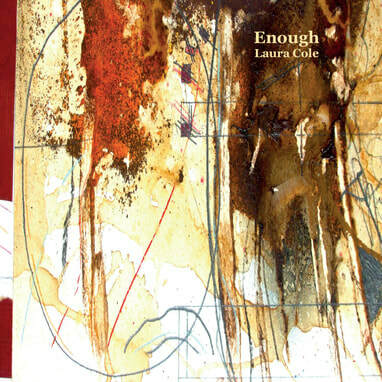 The year 2018 has been an important one for improvising pianist/composer Laura Cole, who has released two double albums during the course of the year that not only reveal her to be one of the most important musicians working in this area of the music, but also perhaps shows that Cole has reached a maturity in her playing where she is able to truly express herself through her music. This battle has been hard won for Laura, and it is therefore not surprising that she has taken time in allowing her playing and composing to develop at its own pace. Her playing with the Deep Tide Quartet on their album See One, Do One, Teach One revealed a player of startling originality, whose contributions were integral to the overall group sound. 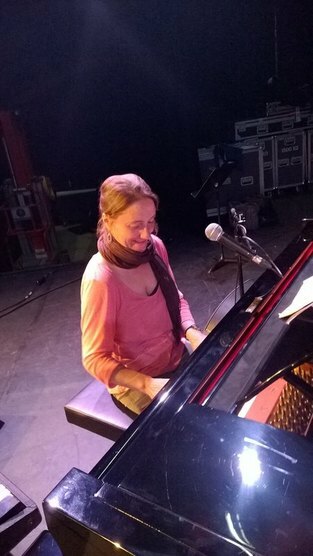 Laura's writing is also bringing forth a unique voice in her writing for the improvising ensemble, Metamorphic, but it is perhaps the solo piano album Enough which is perhaps the pianist's most important statement to date, and finds her with the new found confidence to take a look over the precipice at her own abilities and creativity. Jazz Views has been fortunate in being able to document the recording of the solo album with Laura's journal, As Warm As The Sun, about her preparations for her solo project, and it has therefore a great pleasure to have the opportunity to talk to Laura about her two new recordings released on the Discus imprint. This last year  has seen you release two albums for Discus Music, both completely different. The first for your ensemble Metamorphic and the second a solo piano album. Let's talk about The Two Fridas by Metamorphic first. Can you tell me about the album? Firstly, the albums The Two Fridas (Metamorphic) and Enough (solo piano) being released so close together was a deliberate gesture, in an attempt to reflect their symmetry; although their line ups are different, and my artistic/compositional approach to creating them therefore different, the intention and emotion behind them do, I feel, come from the same place. 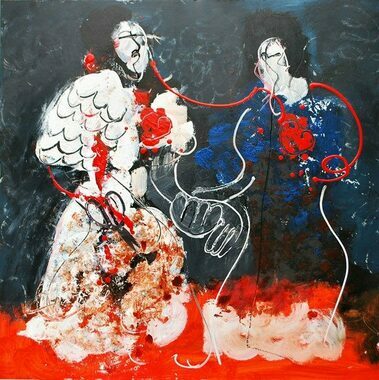 They both reflect a very important time in my personal life, and, for me, are documents and expressions of this time. They are intended to exist as partner albums, an idea which I feel is also echoed in them both being double albums. The original basis for The Two Fridas came from a postcard of Frida Kahlo's painting The Two Fridas, sent to me by Robert Wyatt, with some lovely words on Metamorphic's second album, Coalescence, which I had sent to him. The title track of the album is dedicated to Robert; this is an idea I extended to each track, with dedications to some very special people for each piece. I am a Gemini, and have long been interested in symmetry; so this image, and Robert's thoughtful and kind gesture, resonated very strongly. It took a few years to conceive, but I knew that the third Metamorphic album would be called The Two Fridas as soon as I received this postcard. The band had a wonderful three day session at Real World recording the album; we had been gigging many of the pieces on the album for a while already, so they felt nicely worn in. I think very, very carefully about the running order for both gigs and albums, I do think this is very important, to give each piece an appropriate context, and to create a sense of flow and integrity to the music; I feel The Two Fridas is very much an expression of this. In some ways, I see the music on this album as a long suite, divided into two halves. I feel it is very important to me as a bandleader and composer to try and communicate this sense of flow and integrity as effectively as I possibly can, in presenting albums as whole pieces of work; I feelThe Two Fridas represents an expression of this overall sense of wholeness within the music, and I feel proud to be able to say this. This is the third album by Metamorphic, how do you feel the music has developed over the course of the recordings? Each album we have made together as Metamorphic has been a very special process for me. As bandleader, I have tried to build on each album, and learn from each recording, and maintain and nourish a sense of musical continuity throughout it all. It is very important to me to try and remain open in recording, rehearsal and live settings, and to try and always listen to my colleagues' suggestions, both musically and otherwise; this music is alive, and ever-changing, and I welcome that, and feel the recording process has strengthened in each album as a result. I feel our music has naturally evolved as a consequence of this; it is a kind of collective, creative, ongoing conversation. We are very much a gigging band, so each album has reflected our live experiences. The music on the albums has therefore gradually changed, becoming maybe more abstract and improvised, but also more grounded, and I feel this represents the trust and chemistry I feel we have together as a band. As an improvising artist, how do you deal with the opposite end of the spectrum with the notated side of the music for the band? Do you find composing a natural extension of your improvising, a way of capturing the spontaneous for further development, or does the improvising continue on from the written material? For me, the spectrum is not an either/or; it is a fluid rainbow; both my improvising and composing feed into each other. My compositions often start as improvisations on the piano; but they can equally begin life as poems, or thoughts, or photographs, or dreams. I like to experience and respect my creativity as an all-encompassing process: I relish this. It is such a powerful force, to me. My fellow colleagues in Metamorphic have long been used to this I think, and I believe as a band we try and merge the two; in the end I feel it is about gesture, and intention, and listening. And friendship. Connecting all of this in both live and recording settings is an amazing feeling; one of feeling truly alive, and valued. The ensemble also retains a fairly stable personnel, a band of kindred spirits who understand your processes and trust each other within the open structures that are left in your music, this must be of huge benefit in music of this kind? Yes, it is. It gives me hope, determination and inspiration, in a professional and personal environment which is often difficult to navigate. I am continually surprised by what each band member brings to this music. It is an enormous privilege to play with these dear friends and consummate musicians/composers in their own right, and I feel this brings a real weight to the music. It is always an honour to hear these special people play my music, and to play with them. Alto player Chris Williams (Led Bib) and tenor/soprano player John Martin (The John Martin Quartet) are the longest-standing members of the band; we met while on the jazz course at Middlesex University many many years ago. More recent members such as vocalist Kari Nergaard-Bleivik and drummer Johnny Hunter are also dear friends, and fellow collaborators in different projects; it all feeds in to the overall lovely band vibe. How do you keep the band going and the music fresh? Are there many opportunities to perform with such a large group of musicians? Faith and determination are big factors in this. We are an octet spread all over the UK, so, practically, organising things is not always easy; but in some ways this is also what keeps the music fresh. We are all involved in own our individual projects, and I feel this is what also keeps this music alive and on its toes. Geographical spread engenders ideas too! I have worked very hard to try and provide the band with opportunities; and we are still going, despite it all, so I will keep working at it, to the best of my ability. The solo album is really quite special, and a project that I know is very dear to you. Why wait so long before recording a solo album, and why now to do so? Thank you. Yes, the solo album is very special to me. I hadn't felt ready to embark on the 'solo thing' until recently; I think I was scared of it, scared of the responsibility, scared I wasn't artistically up to it, scared my body couldn't deal with it (I have previously suffered from severe RSI). And I felt I somehow couldn't hold my own at the piano. But then I realised that I had in effect been holding my own at the piano for a very long time, and I needed to let this come forth, in a solo context; and as scary as it was, I decided I needed to face this and embrace it. Hence deciding on the solo residency at Lyth Arts Centre in Wick, Scotland, to prepare for the album. This was at once an utterly terrifying but beautifully cathartic and healing experience, in a wild, remote environment. The solo album was also conceived and recorded in the context of an incredibly difficult time in my personal life; but I decided, as a continuation of a creative agreement I made long ago with myself after recovering from severe depression, that I needed to transform this experience, and be resolute, and just try and express it: I needed to really work at it, and look at myself, long and hard, but also in a forgiving and accepting way. The albumEnough is about being enough for myself, and that being good enough, for me. It is the end result of a lot of very hard work and self-questioning: I am very proud of it for this reason. The music is divided over two discs between compositions written by friends and colleagues and arranged by yourself, and the second disc is compositions and improvisations by you. Can you tell us why you chose this method of working, and firstly about disc one? This distinction was crystallised for me during the residency. I have always loved arranging, and decided I would ask friends and colleagues for pieces for me to arrange for the album; this gave me such huge inspiration, and a framework to my time at Lyth. I felt supported during my time there through these pieces; I felt as if I was in dialogue with these composers and friends within and through the music. I could hear their voices through the compositions. I was lucky to be able to be in contact with all of them, if I needed to be, with the exception of Miles Davis of course; but even he spoke to me as I was working, and said 'Just keep going'. So I did. For me, arranging and composing is two different head spaces, and I was very disciplined during my residency with this, not mixing the two, which really helped to organise my time working there. Hence the two discs and the distinction for the recording and the album. And disc two? Have the composed pieces been written over a period of time, or composed especially for the album? Most of the compositions I wrote specifically for the album, and worked on during the residency. The piece 'Extinguish' was written during the residency and is for my daughter, Martha; I rang her whilst I was in Lyth, and told her I would write a piece for her that day, and asked her to give me a title; she instantly replied with 'Extinguish'. 'Outgoing Vessels' was however written a few years ago, in Brussels, away from the piano; it just poured out of me, onto the page, and is for an old family friend, Bob Hesketh, who had just passed away from cancer at the time. The improvisations on the second disc were recorded in the moment, of the moment, at the recording session. I feel should mention here my dear friend Corey Mwamba's input to the album; Corey produced and mixed the album, and was there as my hugely supportive, listening, critical ear as I recorded. His presence was absolutely invaluable as part of this process. You describe yourself as an improvising pianist and composer, how do you/or do you differentiate between the two discipline or do you view them simply as ways of making music? They are quite simply both expressions of myself; they are just terms; they emanate from the same body, the same sense of me, of my now. I feel I draw from the same well for both. The water might have a very subtle difference in quality and surface tension for both; but both quench a raging thirst. Do you find that there are many opportunities to perform on a regular basis within the musical sound world that you choose to inhabit? I welcome each time I am able to perform. It is as often as I am able to organise and I am grateful to be given the opportunity to do so when it happens. I inhabit this sound world because I feel it is what I have to do, and it is what I know and feel I need to express and explore; I appreciate not everyone will like it or will want to programme it; but when they do, I am very grateful to have the opportunity to present it. Can you tell us about your musical background? How did you get interested in music and playing the piano? I began playing the piano when I was 7, when my parents were given a piano for free. I found myself inextricably and beautifully drawn to sitting down at this wonderful instrument, and entering into its world; I still have the same feeling now each time I sit down to play at a piano. It is a magnetic force, to me. A real sense of wonder. My parents always listened to a lot of music; there was always music playing in the house when I was growing up. As a baby, in the early 70s, my dad would apparently lie on the floor with me and play Miles and Jimi and Stevie to me; he is a huge jazz fan, with an impressive 60s and 70s vinyl collection! As I grew a little older, music would often bring me to tears; there were certain records in the house that I couldn't even look at without getting upset, such as 'I Get a Kick Out of You' by Gary Shearston. I feel my musical and emotional sensitivity have always been very much linked to my upbringing, and the records that were played to me during my formative years. I still draw on this, and think I always will. How did you become interested in composing and playing improvised music?For me, composing and playing improvised music came out of my recovery from RSI. I decided, as I began playing again (I had to stop completely for a few years) that I would define exactly how I would go about it; I had lost a lot of time, and my mental and physical health over it. My way back in to music was through singing, photography and composing; and I was very lucky to have had Nikki Iles as my composition tutor at Middlesex, which is why one of her pieces, 'Meditations', features on the album. She was and is a source of support and inspiration. The freedom I experienced in being able to play again came out in my new found interest in playing freely, in an improvised context, which I continue to enjoy doing to this day. What about influences, and who do you like to listen to? I like to listen to all the wonderful music made by my peers. I am influenced by what each new day brings; the sky. And: pianist Craig Taborn. Can you tell us about some of the other projects you are involved in? Nth Quartet, with Corey Mwamba, Johnny Hunter and Andy Champion; Deep Tide Quartet with Martin Archer, Kim Macari and Walt Shaw; Trio Uroburo with Keith Jafrate and John Pope; Johnny Hunter Large Ensemble: and to anyone who might feel resonances with anything I've said here, do please get in touch! And finally... plans for the future? More of all the above! I will share a secret: the two people I would most like to work with are Kate Tempest and Seb Rochford.